So I just added something new to my blog. On the right hand side, there is a "Movies Recently Watched" list. I don't write a review for every movie I watch. Sometimes I just don't have time to do so. 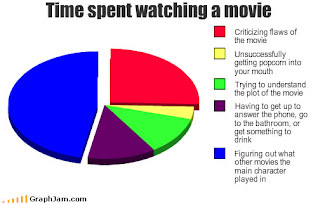 Or, with some movies, I don't really have anything to say other than "It was good" or "I didn't like it". So why bother with a post? So I'm going to just keep track of the 5 most recent, link them to their IMDB page and give them a rating. I rate my movies from a scale of 1 to 5. I find keeping the numbers lower is easier on my brain. And to keep things kind of consistent, I've borrowed my mode of rating from Netflix. 1 out of 5: "Hated It" - If I watch a movie that I absolutely hate, I'll give it 1 star. Though, that has yet to happen. 2 out of 5: "Didn't Like It" - This happens more often. Sometimes the movie is just bad or not my cup of tea. 3 out of 5: "Liked It" - A lot these movies are good and have potential, but fail in at least some aspect. An example would be The Time Traveler's Wife. I liked the idea and story, but I didn't connect emotionally with the characters. 4 out of 5: "Really Liked It" - These are movies that are a lot of fun or connect with me on some other level. These are movies that I could watch again relatively soon. 5 out of 5: "Loved It" - This rating is also rare. I generally reserve these for my favorite movies (ie RoboCop, Pan's Labyrinth, etc). So this rating is generally exclusive. Though, I may try to broaden it a little. But this is just a general breakdown. I don't like all 4/5 movies the same. I really liked The Island of Lost Souls. And I really liked The Raid: Redemption. But I like them for totally different reasons. And some movies may be bad movies, but are really entertaining, such as Mega Shark vs. Giant Octopus, so they will get the same rating as good movies that don't quite connect. So, I guess you could look forward to that. Or not; that's cool too.